Constellation Corona Borealis the Northern Crown, is a northern constellation sitting above the head of the Serpent, constellation Serpens, between Bootes and Hercules. 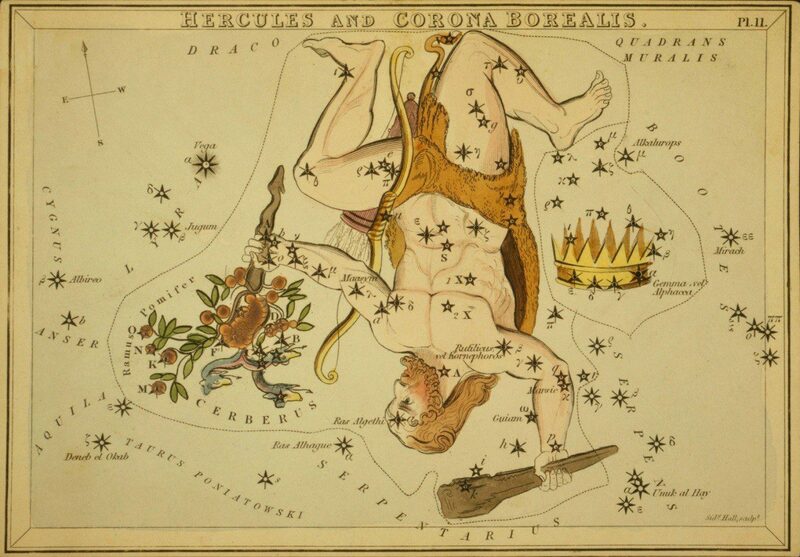 Corona Borealis spans 12 degrees of the Zodiac in the Sign Scorpio, and contains 2 named fixed stars. Corona Borealis represents the garland given by Venus to Ariadne on the occasion of her marriage to Bacchus after she had been forsaken by Theseus. Corona Borealis, the Northern Crown … was the only stellar crown known to Eratosthenes and the early Greeks, but they called it Stephanos, a Wreath; and their successors, who had begun to locate the Southern Crown (Corona Australis), added to this title of the original the distinguishing protos; and beta Borelos to show its priority and its northern position. The Latins adopted the Greek name and adjectives in Corona borea, borealis, and septentrionalis; and further knew it as the Crown of Vulcan fashioned ex auro et indicis gemmis; or of Amphitrite, probably from its proximity in the sky to the Dolphin (Delphinus) associated with that goddess. 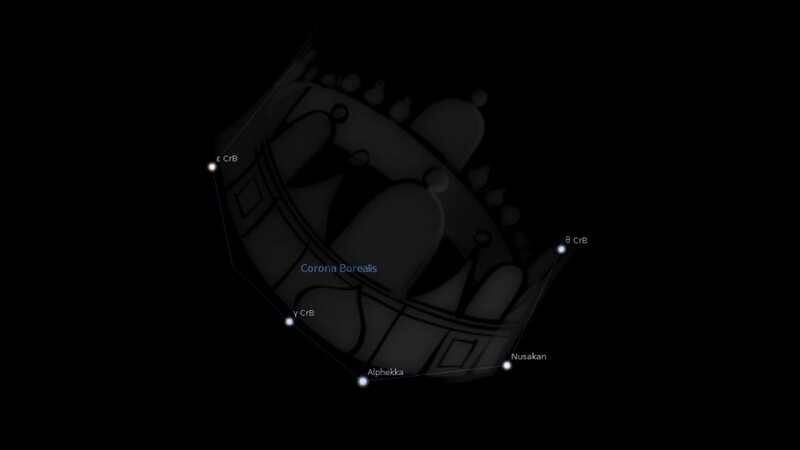 Corona the Crown’s lustrous ring, which twinkles with varying luminosity; for the circle is dominated by a single star, which with passing splendor sparkles in the mid forehead and enhances with its blazing flame the bright lights of the constellation. They shine as the memorial of deserted Ariadne. So here, the CROSS is closely followed by the CROWN! True, “we see not yet all things put under Him, but we see Jesus… for the suffering of death crowned with glory and honour” (Heb 2:9)… The Hebrew name for the constellation is Atarah, a royal crown, and its stars are known today in the East by the plural, Ataroth! Its Arabic name is Al Iclil, an ornament, or jewel. It has 21 stars: one of the 2nd magnitude and six of the 4th. It is easily known by the stars θ, β, α, γ, δ and ε, which form a crescent. Its brightest star, α, has the Arabic name of Al Phecca, the shining. 1. Fixed Stars and Constellations in Astrology, Vivian E. Robson, 1923, p.40. 3. Star Names: Their Lore and Meaning, Richard H. Allen, 1889, p.173-175. 4. Astronomica, Manilius, 1st century AD, book 5, p.29, 321. 5. The Witness of the Stars, E. W. Bullinger, 8. Corona (the Crown). Glad someone noticed! I am writing up all of the constellations before I start to fill in the fixed stars. This really is my passion, but unfortunately the horoscopes take up so much time, but they do pay the bills. that ans the readings I am so far behind with, better to back to it. Do not use Bullinger as your reference. It is a false science, to put it blunt, a conspiracy theorist. There is no Arabic word for al Iclil, he just made it up, a 19th-century liar. Robson is a much much better writer in this case.